ZG traveling grate coal fired boiler can be used in bath room, school, hospital, restaurant, food factory, chemical plant etc. DZL coal-fired traveling grate boiler is composed of the body, chain grate, the former arch and the after arch, light furnace wall, steel frame and insulating layer etc. The boiler shall adopt single drum and vertical layout. The body comprises pot shell, smoke box, water wall tube, and lower header on both sides. The tube plate adopts all-welded structure. The chain grate adopts light thickening style. The electric control brings about the step-less speed regulating of grate; the air is sub-independently supplied; the warning shall be given when its working parameter is out of the redesigned one. Our boilers are really new environmentally friendly products. 4. reasonable air distribution and flexible adjustment, it can be adjustable according to combustion conditions. 6. all-welded tube plate, no relaxation of the leakage. 7. thicken grate, higher intensity, long lifetime of fire grate and long maintenance cycle period. 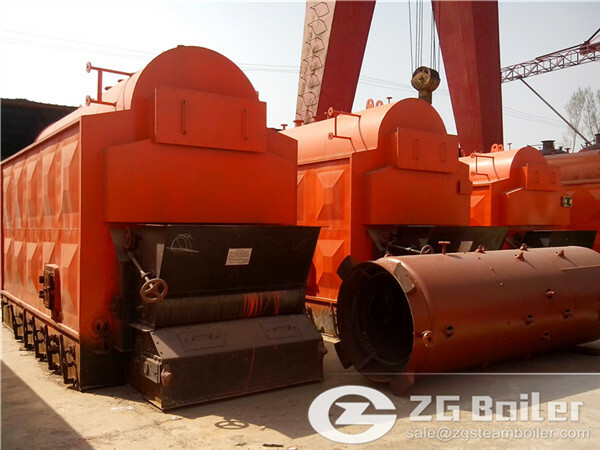 ZG coal fired traveling grate boiler is one of our products. If it is not suit for you, we can supply different kinds of boiler for you to choose.